In the culinary arts, the term cutlet is used to refer to a boneless, thin cut of meat—chicken, veal, pork, or lamb—that cooks very quickly and is usually pan-fried. Most cutlets are made by pounding the meat until there's even thinness and are often dusted with flour or coated in breadcrumbs before cooking. The classic veal piccata, as well as chicken piccata, is made from veal and chicken cutlets, respectively. When producing cutlets, the meat is usually taken from the leg or rib section of veal, pork, or lamb, while chicken and turkey are from the breast. Pork is a convenient meat for making cutlets because the shape of the loin lends itself to producing thin cuts of uniform size and shape. Veal cutlets may also be labeled as "scallops" or "scallopini." On restaurant menus or in cookbooks you may see cutlets described as schnitzel, a traditional Austrian dish where cutlets are dredged in flour and then coated in egg and breadcrumbs and fried; Weiner schnitzel is made from veal, in which case it is usually made from center cuts from the leg muscle. While the meat itself is tender, it must still be carefully fabricated to remove any connective tissue that could be chewy after it's cooked. Conversely, cutlets made from chicken and turkey come from the breast, which is already tender. What makes a cutlet a cutlet is pounding the meat until it has even thinness. Pounding the cutlet flattens it, which in turn makes it cook more quickly, an advantage since the meat is usually from a tougher section of the animal, and shouldn't be cooked any longer than necessary or else it will turn out chewy and inedible. 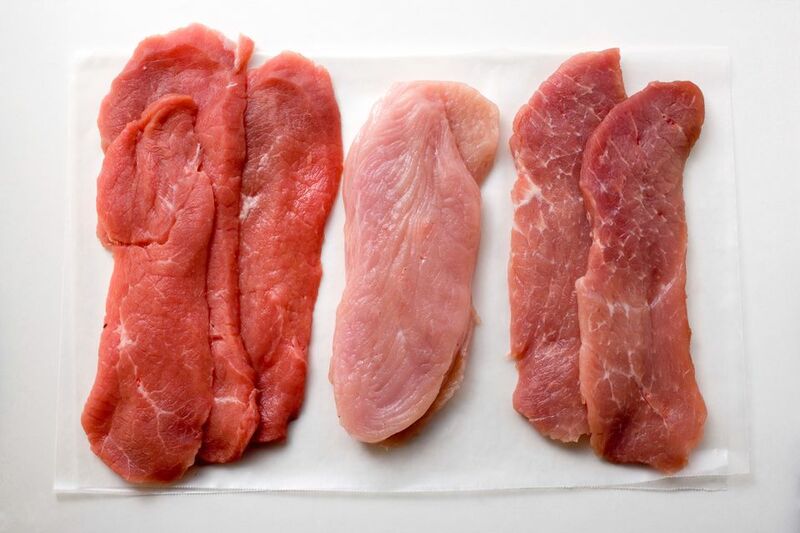 If you are using thick cuts to meat to make cutlets, you can simply place the meat on a cutting board between two sheets of parchment paper. Using a meat mallet or other tool such as a rolling pin, pound the meat, making sure to apply even pressure and cover the entire piece so it results in an even thickness. Because cutlets—no matter what type of meat they are—are so thin, they cook in a short amount of time. Most recipes will call for dredging in flour or coating in breadcrumbs before pan-frying, but you can also simply season the raw cutlets and cook in the oil or butter. Frequently, the recipes will include making a sauce in the pan after the cutlets are finished, such as with veal saltimbocca and lemon chicken with mushrooms. Veal (or chicken) Milanese is a breaded cutlet often topped with a salad. Cutlets may also be simmered in a sauce, broiled, or roasted, although these methods are not as common. For some reason, the word cutlet is sometimes used to refer to something that is actually a croquette, which is a mixture of mashed potatoes or rice with other ingredients and formed into shapes, and then dredged in flour and fried. Thus, the only thing these two dishes have in common is the dredging and frying. However, what defines a cutlet is that it's made from a thin slice of meat, not the fact that it's dredged and fried. Although beef is not one of the meats made into cutlets, beef cube steak, which is used for making chicken-fried steak or swiss steak, is sometimes referred to as a beef cutlet. Cube steak is usually a thin cut of meat from the beef round primal, which is then run through a mechanical tenderizer, producing the characteristic cube-shaped marks.